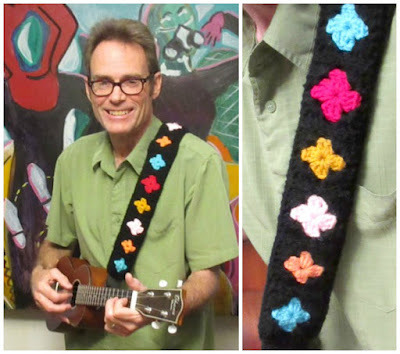 I wanted to jazz up my ukulele. I decided I needed a colorful instrument strap. I have a boring, black manufactured strap that does the job. Since my playing isn't that great, I need to distract people with my smile and colorful accessories! 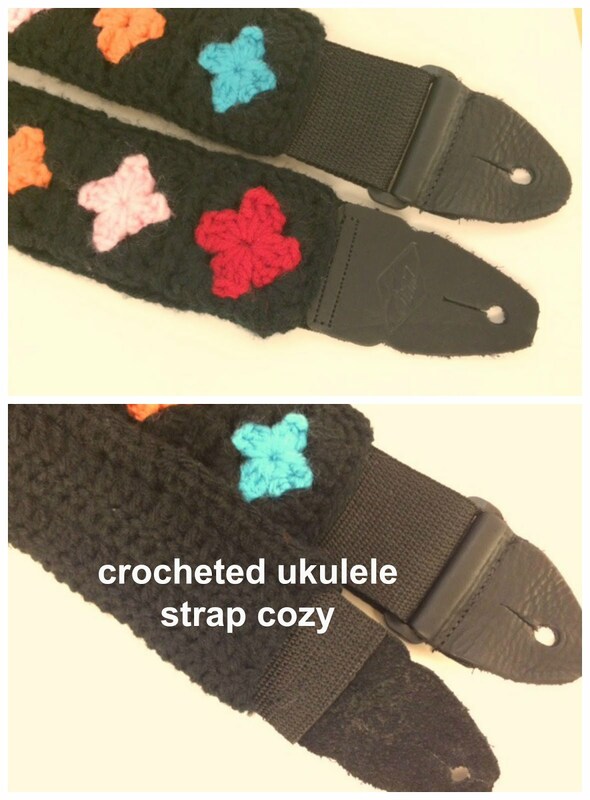 I checked Ravelry and other online sources for crocheted and/or knit instrument straps. I came across quite a few. I liked the idea of just making a cozy or sleeve for my existing strap. That way, I wouldn't need a fabric back to stabilize the stretchy yarn stitches. I have an abundance of acrylic yarn in various colors. I decided that a black trim with different color centers would be a good choice. I crocheted small two-row granny squares and joined them together in a long strip, measuring my existing strap. Then, I crocheted a back, lengthwise, in one color and joined it to the squares on the side of the strap, leaving each end free so I could slip the existing strap through. It works perfectly! I can't wait to make more in different colors and materials! I'm thinking a crocheted, stripey one using Noro yarn scraps would be great! I sound so much better with that dazzling strap! Will you do one on commission? I'm pretty sure my kid would love one of those. Thanks for the compliments, Ross. No, I don't do commissions. Really, this is very easy..you could do it with a piece of cool fabric too. 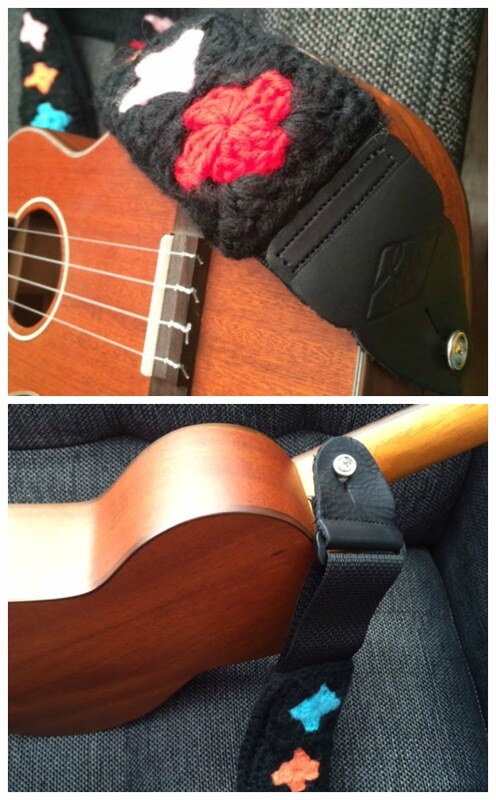 It's just a sleeve for an existing ukulele strap. BTW...sweet video of your daughter! Guess we'll have to give it a try ourselves, DIY-style. I know you can do it!!! Post pictures when you finish.